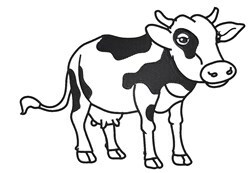 What an adorable cow outline design! Add this little guy to nursery room decor, bedding or a cute onsie! King Graphics is happy to present Cute Cow Outline machine embroidery design which has 10360 stitches and is [152.40 mm x 109.47 mm] large. If you would like to view more embroidery patterns please search on our embroidery designs page.